Bridges are sized for an individual rated load. Runways are sized for the combined weight of all loads, so they use a heavier track series than the bridges. No “dead” coverage areas (areas with no bridge coverage). Each bridge can travel the length of the system. Limited “dead” coverage areas between bridges, so bridges can be used side-by-side. Bridges weigh less, making them easier to move. Use larger sized runways, so they may cost more than intermediate stops or bridge buffer systems. Bridges are sized for an individual rated load. Runways are sized for the heaviest individual load, so the runways use the same track series as the largest bridge. 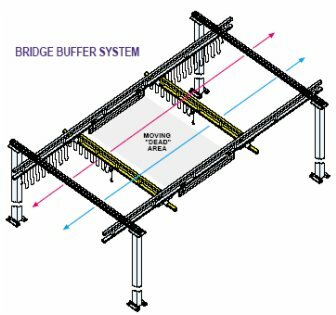 Bridges are physically separated by wheeled, movable bridge buffers. Usually cost less than mixed capacity systems because they typically use smaller sized runways. Buffers take up space, creating a moving “dead” space between bridges. Note: With two bridges, the dead space equals half the distance of the support centers (L1 from the dimensional charts). 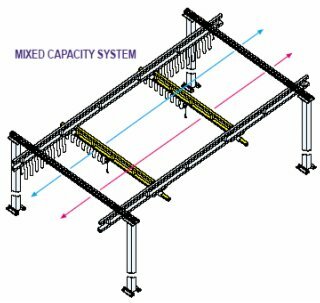 When a third bridge is added, the dead space occupied by the additional bridge buffers equals the distance of the support centers. Special support steel may be required. Bridges are sized for an individual rated load. Runways are sized for the heaviest individual load, so the runways are same size as largest bridge. 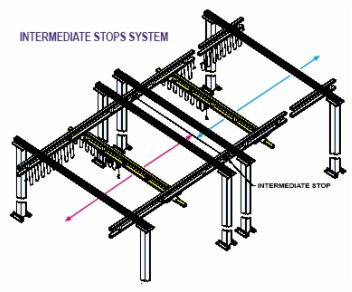 Bridges are physically separated by internal stops or bumpers. Extra hangers may be required to eliminate overload. Use smaller runways; therefore typically cost less than mixed capacity systems. Fewer potential “dead” spots in the system. Each bridge on the system can travel only a portion of the length of the system. May cost more to install since they require extra supports to eliminate an overload situation.